Ms. G (that's short for Groundhog), a 4-year-old woodchuck from the Massachusetts Audubon Society's Drumlin Farm, has been nominated to be the state's first official groundhog. If approved by the Legislature this year, she would be the first female groundhog in the country to hold such a title. That's right! The nation's first female Groundhog Day groundhog. What historic news! While some say the political climate seems right for a female woodchuck, there is a natural reason that the shadow-seeing had traditionally been left up to the males. Male woodchucks are the early risers of winter, driven out of hibernation by their desire to mate. Females, on the other hand, hang around their dens and wait for gentlemen callers. But times may have changed. "Don't you think the nation is ready for an official female groundhog?" said Jan Kruse, an Audubon spokeswoman. Found by a family when she was a pup, apparently abandoned, Ms. G oversees Groundhog Day festivities at Drumlin Farm, where a grass-roots campaign is underway for statewide recognition; more than 220 people have signed a petition on the website massaudubon.org supporting her appointment. 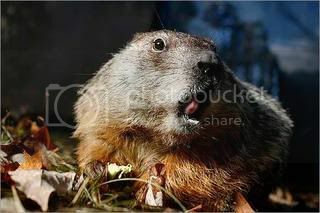 St. Louis would have a female as its official groundhog, because the zoo replaced its male with a female when the former passed away, but the female is soooo cranky when awakened that the zookeepers don't dare get her up for Groundhog's Day. To the St. Louis groundhog, I say, "You go, girl." Wish I could get away with such behavior.